Florida Democratic gubernatorial candidate Andrew Gillum, left, speaks to supporters as his wife R. Jai Gillum listens during a Democratic Party rally Friday, Aug. 31, 2018, in Orlando, Fla.
Florida Democratic gubernatorial candidate Andrew Gillum said a racist robocall mocking him by featuring a man speaking in a stereotypical black dialect and jungle noises in the background was “deeply regrettable,” CNN reports. The 78-second prerecorded message was paid for by a white supremacist and anti-Semitic video podcast hosted by Scott Rhodes of Idaho. It is not clear how many Florida residents received the call. This call comes days after his GOP opponent, Rep. Ron DeSantis, said that Florida voters should not “monkey this up” by electing Gillum as governor. Of course, he said it wasn’t racist—even though we all know it was racist. 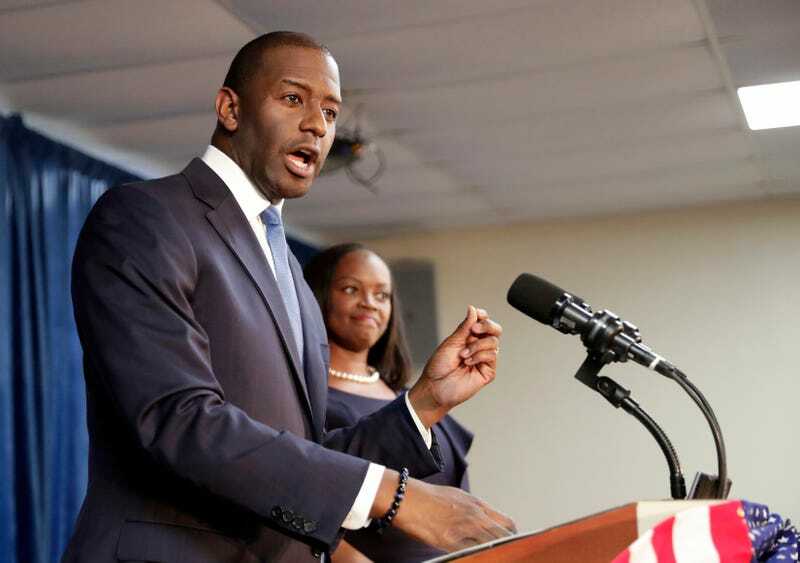 Gillum added that “people are taking their cues” from DeSantis and President Donald Trump. “We saw in Charlottesville (that) it can lead to dangerous outcomes,” he said, referencing last year’s lethal clashes between white nationalists and counterprotesters in Virginia. DeSantis and the racists he hopes to rally to the polls clearly see Gillum as a threat and are going directly to Donald Trump’s white supremacist playbook to gin up support. Gillum refuses to get in the mud and that is certainly a great strategy to win the governor’s mansion in November.